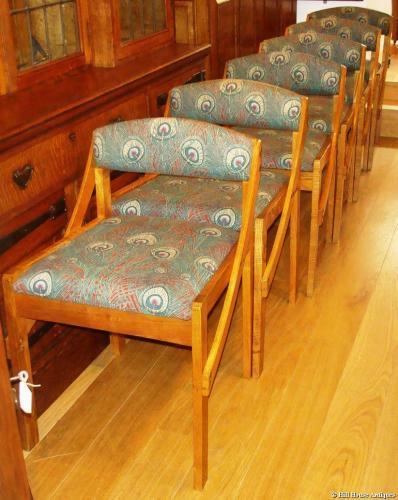 A great set of six c1950`s/60`s Arts & Crafts Liberty Cafe chairs, based on the original c1900 designs of the iconic Music Room chair by the German Architect, Richard Riermerschmid. Liberty & Co had their own version at the time and these later ones are very much in that manner; albeit updated for a more "modern" look and also showing Cotswold School influence with revealed construction elements; beautifully made. These actual chairs were also at one time used in the 2nd floor ABC Cafe at Liberty`s. Attributed to Liberty`s workshops. Recently upholstered in Liberty Hera fabric.